Karen Pavelka leads a conservation workshop in Puerto Rico. Texas iSchool Senior Lecturer Karen Pavelka traveled to Puerto Rico in January to assess damage and provide technical assistance to cultural institutions affected by Hurricane Maria. The Category 4 storm hit the American territory in September 2017, devastating the island and crippling its infrastructure. In addition, many of Puerto Rico’s libraries, museums and archives experienced catastrophic damage. Hundreds of thousands of Puerto Ricans are still without power. Electricity had recently been restored to most of the institutions that Ms. Pavelka visited in January, although she said it was still not entirely reliable. She was part of a four-person assessment team deployed by National Heritage Responders (NHR), the volunteer emergency recovery team of the American Institute for Conservation of Historic and Artistic Works. One of three NHR teams to visit Puerto Rico last month, Ms. Pavelka’s response team was led by Laura Hortz Stanton, executive director of the Conservation Center for Art & Historic Artifacts in Philadelphia. Beverly Perkins, Division Director of Museum Services at the Buffalo Bill Center of the West, and Jason Church, Materials Conservator with the National Center for Preservation Technology and Training, were also team members. The Inter-American University of Puerto Rico in San German, where the library had flooded and the roof leaked in multiple places. Texas iSchool adjunct faculty member Rebecca Elder, the coordinator of NHR, has been helping to organize response teams’ visits to Puerto Rico since mid-November. Ms. Elder said NHR is still exploring the best ways to continue to help. For those who wish to contribute to the recovery, Ms. Elder suggested making a donation to the the nonprofit Foundation of the American Institute for Conservation of Historic and Artistic Works (FAIC) and designating the funds for emergency programs. Ms. Elder also encouraged librarians and archivists to seek out local emergency response groups in their communities and neighborhoods to better prepare for the possibility of a future natural disaster in their area. Scenes from senior lecturer Karen Pavelka's recent symposium in China. A little over a decade ago, the iSchool’s Karen Pavelka witnessed a breakthrough for conservation of one of the world’s oldest cultures. In 2004 she was invited to the Guangzhou province in China, northwest of Hong Kong, to give lectures at a symposium on the preservation and conservation of rare books. When Ms. Pavelka arrived at the School of Information Management at Yat-sen University, however, she realized it was the very first national symposium in her field. The conservators had come from libraries and universities throughout China, and most of them did not know each other. Ms. Pavelka returned to the conference for the first time in 12 years this November. 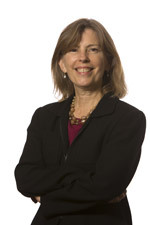 She delivered a keynote speech on the preparation and response to disasters, one of her specializations as senior lecturer and conservator at the Texas iSchool, where she has led outreach and demonstrated salvage techniques after natural disasters like the Bastrop wildfires and severe floods in Wimberley. In China, Ms. Pavelka found that the International Conference on the Preservation and Conservation for Rare Books had grown considerably since 2004. Conservators were comparing notes and discussing their teaching strategies. Ms. Pavelka said Chinese paper is quite different than paper in Western nations, which requires some modifications to approaches and techniques she uses at The William and Margaret Kilgarlin Information Preservation Lab at the UT-Austin School of Information. But most paper conservators’ best practices translate across languages, cultures and materials, Ms. Pavelka explained. 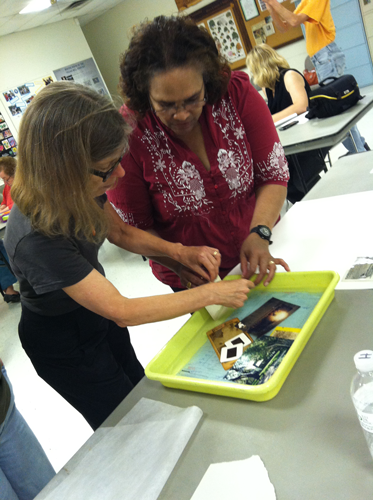 Karen Pavelka with the University of Texas at Austin’s School of Information teaches Camille Stephenson how to clean damaged photos and slides during a recent workshop. The San Marcos Extension Education Club partnered with the University of Texas at Austin's School of Information to host a Salvage Workshop to train volunteers on how to clean damaged photos, books and documents. Karen Pavelka, a lecturer, and a team from the School of Information presented the workshop on June 3rd at the Extension office in San Marcos. Those participating included Extension Education Club members and other volunteers wanting to help with cleanup efforts now and in the future. Participants learned how to handle items damaged by water and flooding. The workshop also included tips on how to store items to limit or prevent damage in the future. A video of the workshop is available here. You can also view video interviews with a few of the failitators and participants in this Daily Texan video. For more information about cleaning or preserving photos, books, etc., please feel free to contact Karen Pavelka at 512-903-9564 or pavelka@utexas.edu.